Passwordless authentication allows your users to log in without having to enter a password. Users are authenticated through one-time passcodes delivered via SMS or email. 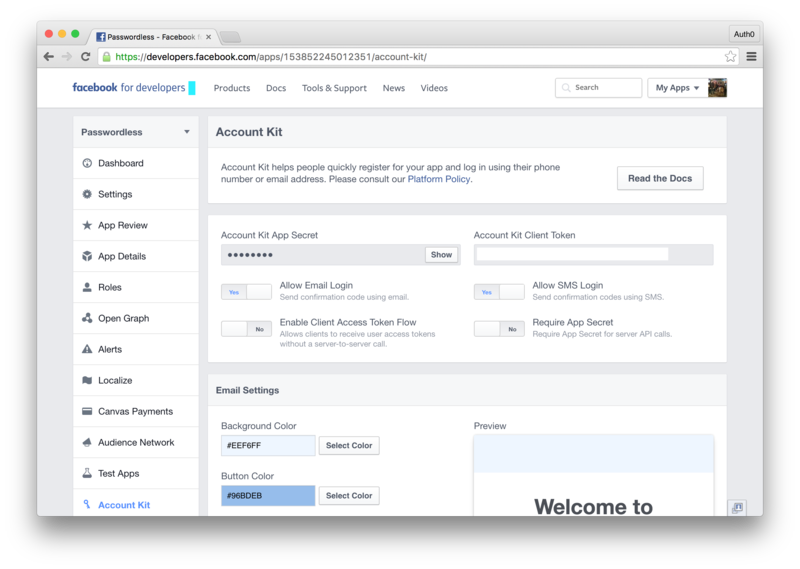 Learn how you can implement passwordless authentication in your application with Facebook Account Kit. Alternatively, learn about Auth0 Passwordless and how you can have greater control over your passwordless integration. We are going to write a lot of code in this tutorial. If you would like a quick reference, all the code is located in this GitHub repo. App developers have to walk a fine line between usability and security. If your authentication system is too complex, you'll lose customers, but if you skimp on security you could lose a lot more. Social login providers like Google, Facebook, and Twitter have streamlined the registration process. Two-factor authentication has made it harder to compromise accounts and passwordless authentication is making it easier than ever to provide a seamless user experience. Nobody likes having to remember yet another password. The end user has trouble remembering a unique password for each service so they tend to reuse a single password; the developer has to figure out the best way to hash, salt, store, and retrieve the password. Then, there are the password complexity requirements, password reset forms to implement, and a whole bunch of other items to check off that will make you ask "isn't there a better way?" There is! Passwordless login! Passwordless or password-free authentication allows a user to sign up and log in to your app without a password. Rather than entering a password, the user is given a one-time code or link delivered via SMS or email, which acts as the verification for the user. Many companies are embracing passwordless authentication including Medium, Slack, and Twitter. Single Sign On (SSO) allows users to log in to multiple services with a single account. SSO integrations are commonly found in enterprise environments utilizing many disparate services. Combining passwordless authentication with SSO can greatly enhance the security and usability of such environments. Facebook is embracing passwordless authentication with the release of Facebook Account Kit. 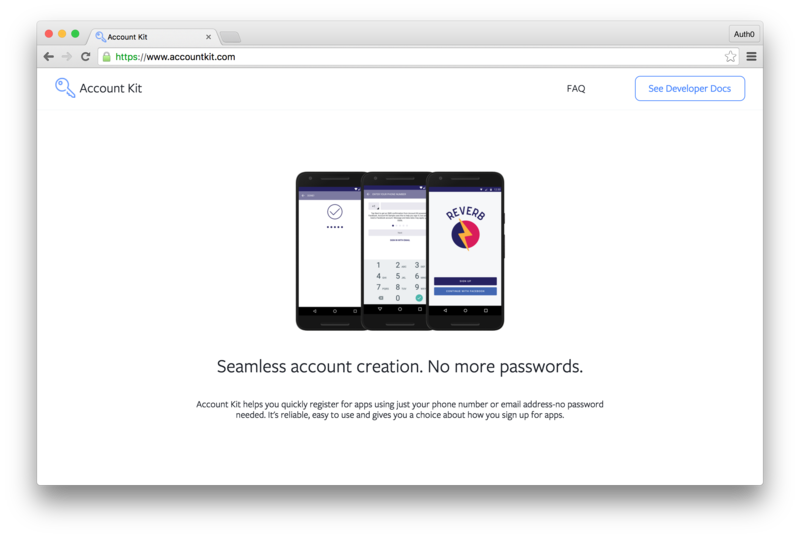 Facebook Account Kit allows developers to add passwordless authentication to their applications. Users authenticating through Account Kit do not even have to be registered Facebook users. Currently, users are able to log in by simply providing a phone number or email address. Account Kit takes care of sending out one-time codes and links and verifying them. Additionally, Account Kit allows for certain customizations such as allowing users to edit the colors of the dialog box, whitelisting and blacklisting by country codes, and a few other settings. Facebook Account Kit just launched, so additional configuration and customizations options in the future are expected. To get started you will need to have a Facebook Developer Account and a Facebook app with Account Kit enabled. To enable Account Kit, simply navigate to the Account Kit tab in your Facebook app and follow the directions. For the backend to process the requests, you'll need your App ID which can be found on the dashboard of your Facebook app and your Account Kit App Secret which is located in the Account Kit tab. With our credentials in order, let's implement the backend. The backend handles two routes: / and /sendcode. The / route is our landing page where the login options will be displayed. The /sendcode is a route that we will call programmatically once the user has verified their one-time code. Our frontend will have two views. A login view and an authenticated view that will show the logged in users information. The login view we'll call login.html and the authenticated view we'll call login_success.html. Let's build the UI for these two views. We have omitted common code that is not relevant for readability. You will find the complete example in the GitHub repo. As with the login view, some code was omitted for readability. With the backend and frontend complete, we are ready to implement Facebook Account Kit. We have already included the SDK in our login.html view, so we can jump straight into the implementation. Additionally, we'll add a hidden form that will send the authenticated token server-side. We have added functionality to handle both SMS and email authentication. The AccountKit.login method takes three parameters: login method, parameters object, and callback function. The login method and callback function are pretty self-explanatory, but the parameters object we've left blank. Depending on the login method used, you can pass parameters such as the telephone number or email address that will be prefilled when the AccountKit dialog is opened. For the full API spec, check out the Facebook doc. Let's walk through the steps of how passwordless authentication works with the Facebook Account Kit. Note: When using the email option, the Account Kit dialog box needs to remain open. Once the link is clicked, the dialog box will close on its own. The link does not have to be clicked on the same machine, for example, you can log in on your laptop and click the link from your mobile device and it will still work. 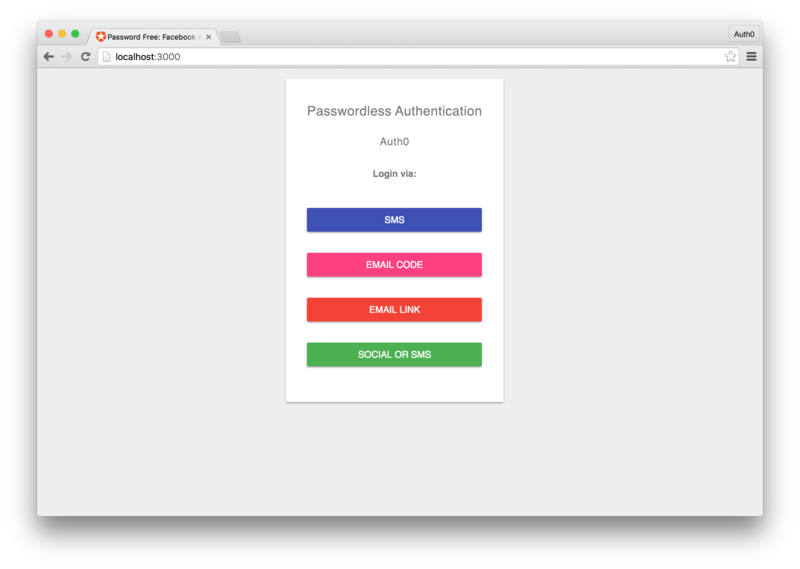 The Auth0 Passwordless SDK is available for iOS, Android, and the Web. For the best comparison, we'll keep our app as close as possible to the one we built with the Facebook Account Kit. For Auth0 Passwordless, you will need an Auth0 account. If you don't already have one, you can sign up for one free of charge. As we won't be exchanging the token server side, our backend will be much simpler. 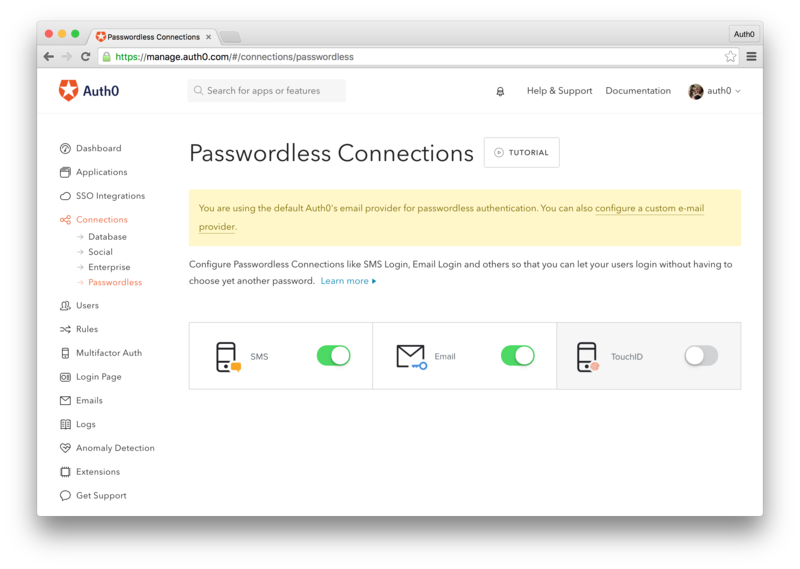 Additionally, we'll need to configure passwordless authentication in our Auth0 dashboard. To do this, in the dashboard, navigate to the Connections then Passwordless tab. As we are building a web app, we won't be able to implement Touch ID, so just flip the switch to on for Email and SMS. For the SMS integration, we'll need a Twilio account. You can sign up for a free Twilio trial account here. From our Twilio dashboard, we're going to want to get our SID, AuthToken, and the Phone Number that Twilio will give us. We'll add these credentials in the SMS settings in our Auth0 dashboard. The email integration is much simpler by default. We only need to turn it on and, in the settings, select the Auth0 app we'd like the passwordless to work with. By default, the emails will be sent from Auth0, but you can easily configure your own email provider in the email providers section of the management dashboard. There are a number of configuration settings to play around with on both the SMS and email passwordless integration. You can set how long a code is valid for, customize the message the user receives, disable passwordless signups, and more. We'll just stick to defaults in this tutorial, but you should explore and customize these settings to meet your needs. 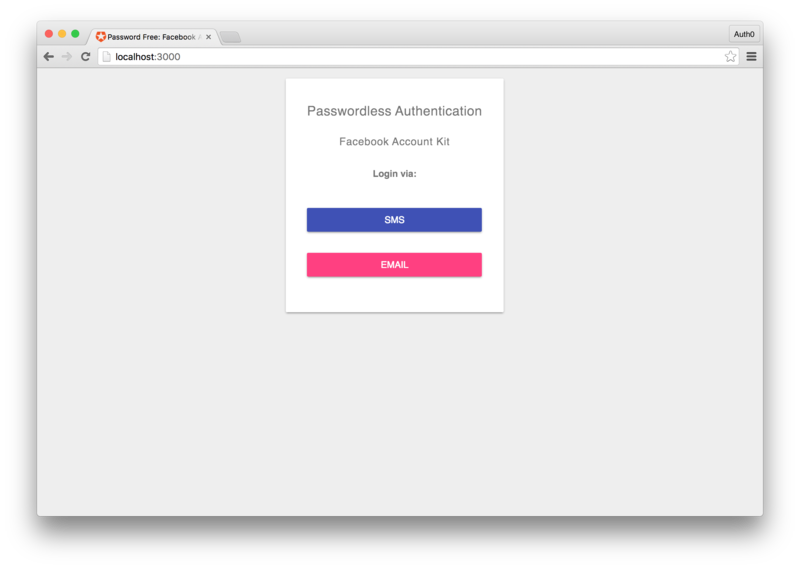 The frontend for our Auth0 Passwordless app will be identical to that of the Account Kit app we built earlier. The only notable difference will be the different authentication options. Auth0 provides various options for passwordless authentication. In addition to SMS code and email link verification options, Auth0 provides the ability to send verification codes to emails as well as combining multiple authentication options within a single workflow. You can see the UI changes in the GitHub repo. 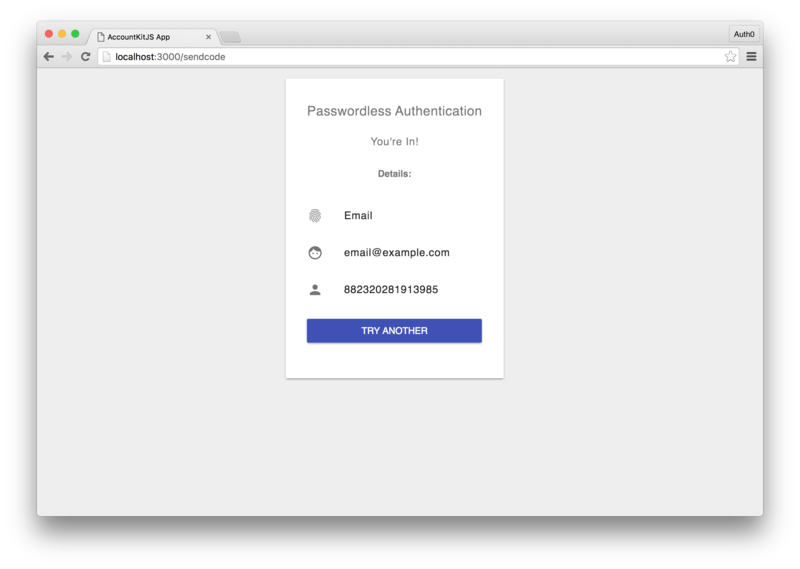 To integrate passwordless authentication, we'll use the Auth0 Passwordless SDK. We'll show how to integrate passwordless in four different ways: SMS, Email Code, Email Magiclink, and Social or SMS. For additional ways, check out the docs. You will need to get your Client ID, Domain, and Callback URL to proceed. You can get all three of these from the Auth0 management dashboard. With this code implemented, let's launch our server and go through the workflow and test our application. As you can see both passwordless authentication flows are fairly similar. Both allow the user to authenticate with minimal effort. Auth0 Passwordless is more customizable and allows for a greater range of integrations and use cases. Passwordless authentication is a great way to provide an alternative login option for your clients that is secure and easy to use. Facebook Account Kit provides a great starting point for implementing passwordless authentication in your applications. If you need greater control and customization though, Auth0 Passwordless may be right for you. 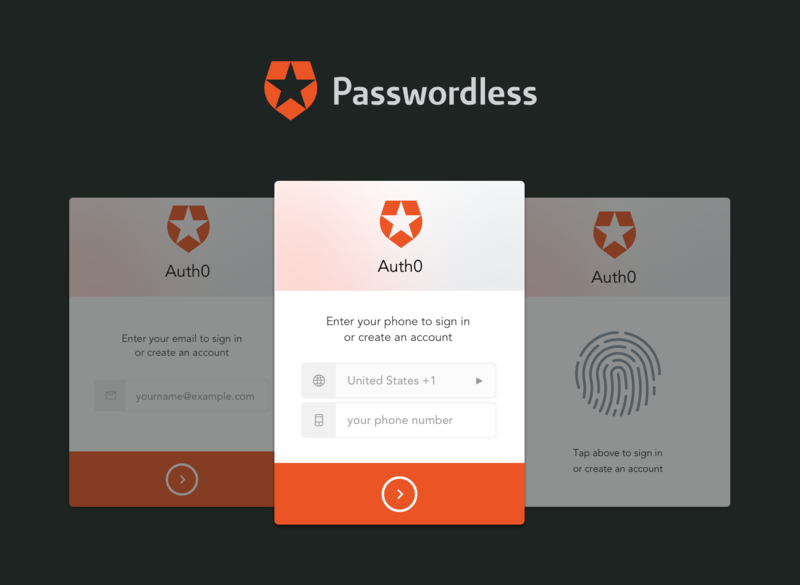 Learn more and get started with Auth0 Passwordless today!